Gabriel Mark Lipper‘s paintings are filled with lush color and strong brushwork, creating evocative moods. 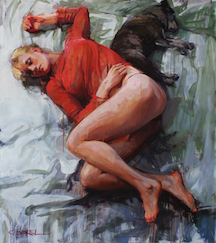 Lipper’s figures are beautifully rendered with strong light and confident form, a nod to his academic background, while his compositions and subjects are anything but academic. This exhibition will include a range of Gabriel’s subjects from unconventional portrait and moody landscape to lush, painterly still life. In these paintings focusing on the beauty of the immediate, being at absolute attention to light and subject, responding in that same moment with his skills as a painter and bringing that moment to life on the canvas is at the heart of this practice. Join us for the First Friday Artwalk artist reception Friday, March 3rd, 5 -8 p.m.